Excavations for the A14 Cambridge to Huntingdon Improvement Scheme have produced enormous quantities of pottery – nearly four tons, in fact, at our last estimate! 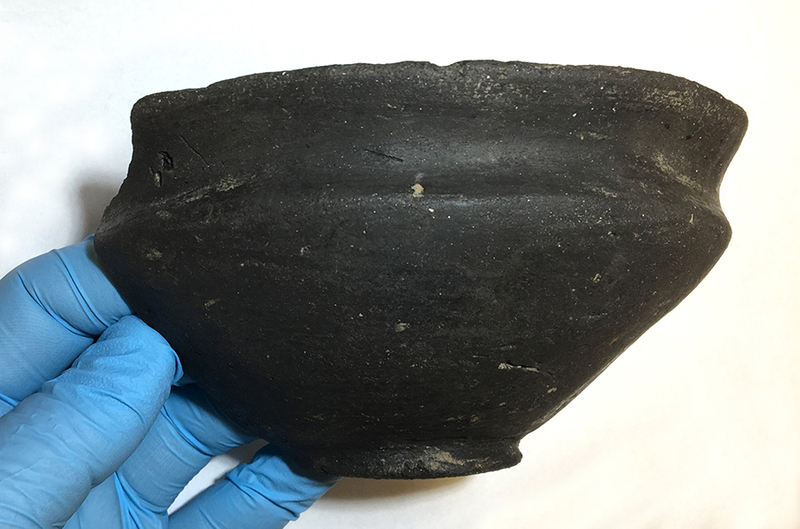 Over the coming year, MOLA Headland Pottery Specialist Adam Sutton and a team of 9 other experts will sort through these finds and figure out what they can tell us about what life was like in Cambridgeshire over the last 6000 years. First up is this rare complete example of a kind of pot we call a ‘collared urn’ because of the broad band around the top part of the pot. It dates to the earlier part of the Bronze Age, somewhere in the range of c.2200-1450 BC. 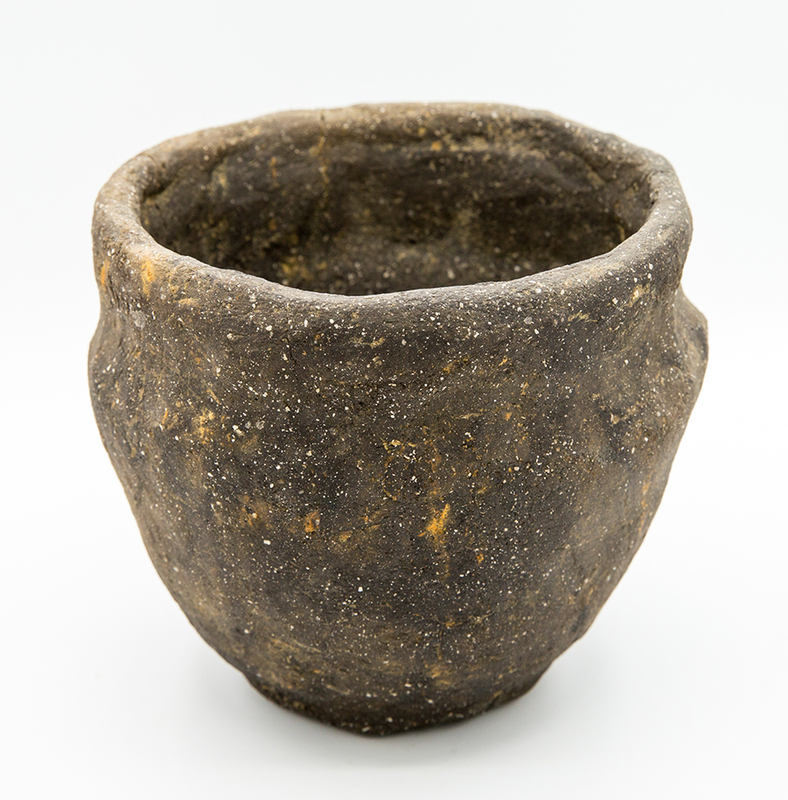 Collared urns are generally found in burial contexts rather than as part of domestic assemblages, as those which remained in everyday use were more likely to end up broken. This example is no exception: it was used as the urn for a cremation burial. If you look closely, you will see that the vessel has been finely and elaborately decorated using cord impressions arranged in a geometric pattern around the collar. During the earlier part of the Iron Age there is a clear distinction between ‘fine’ and ‘coarse’ vessel types. This pot dates to around c.600-350 BC, and falls into the ‘fine’ category. It is an example of what is known as a tripartite bowl, because of the three angles in its profile. Whoever made this pot did so with a considerable amount of skill: the clay used to make it has been very finely prepared, the surfaces have been neatly burnished so as to give them a nice shine, and the firing was evidently sufficiently well controlled that the vessel has been evenly blackened all over. 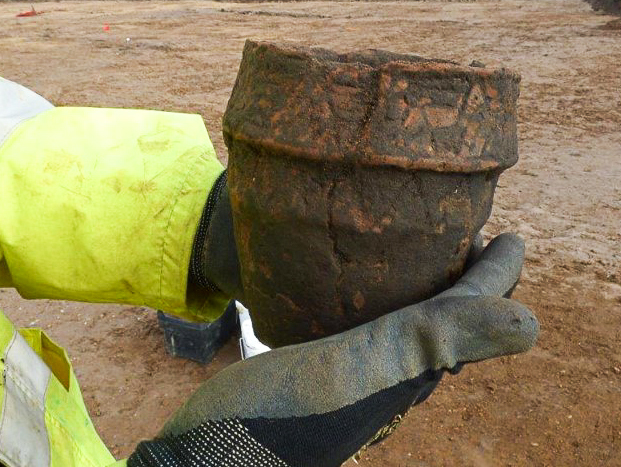 The vessel was recovered from a waterhole or well on a settlement site near Fenstanton, in which it may have either been lost or deposited as rubbish, or deliberately placed as an offering. This complete early Iron Age bowl, meanwhile, falls into the ‘coarse’ category. It was found in a similar waterhole, at the same site near Fenstanton. This coarseware bowl is more roughly made, using clay that has been tempered with fine pieces of white flint, and being only crudely smoothed – rather than burnished – on the outside. Simple bowls and jars like this with angular shoulders and tall rims are typical of the period, making up the majority of pottery that was used around the home. The fact that this vessel has survived in its entirety suggests that it may have been deliberately placed in the waterhole, perhaps as a closing deposit for the well. Exactly why people in the Iron Age often used pots as offerings in this way is something of a mystery. Samian ware is probably the most iconic of all Roman pottery types. 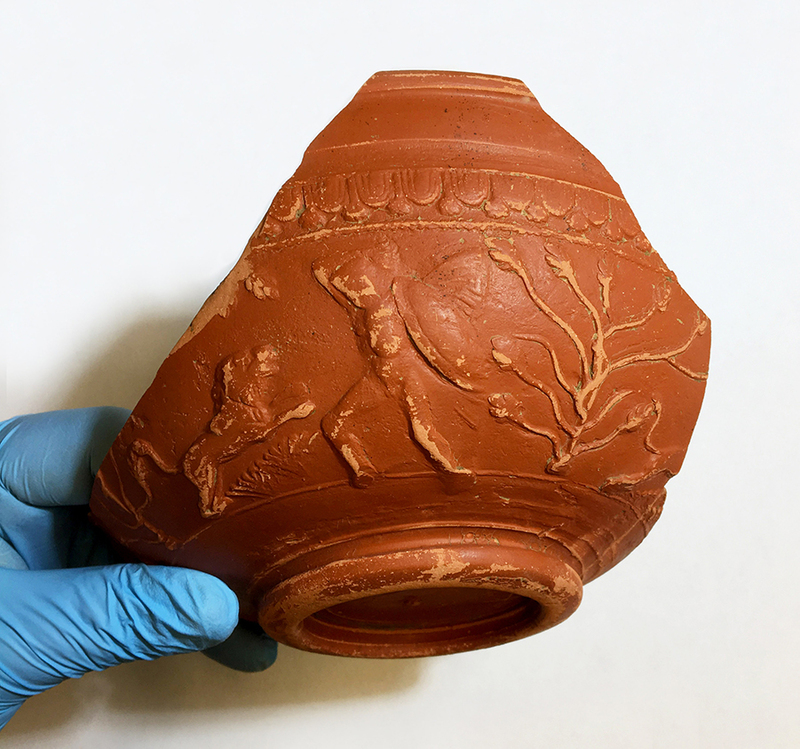 Mostly made in France and Germany between the first and third centuries AD, samian vessels like this one are bright red and often very elaborately decorated using mould-made designs. This particular design shows a human figure fighting a lion, a motif which is repeated four times around the body of the bowl. Mythological and combat scenes are common on decorated samian wares. The individual figures will have been made by impressing a separate stamp into a mould. Each stamp could be used in different combinations and arrangements to make a range of designs. This is very handy for us as archaeologists, as the stamps can be associated with different production centres, and sometimes even individual potters, giving us a fantastic insight into the ways that crafts and artistry were conducted in the past.